The Jim Thompson story is a fascinating one. A trained architect and former CIA agent, he is credited with reviving the Thai silk industry in the period after World War II. He settled in Bangkok and transported traditional teak houses from regional locations to form his home, collecting an art collection at the same time. In 1967 he disappeared in mysterious circumstances. 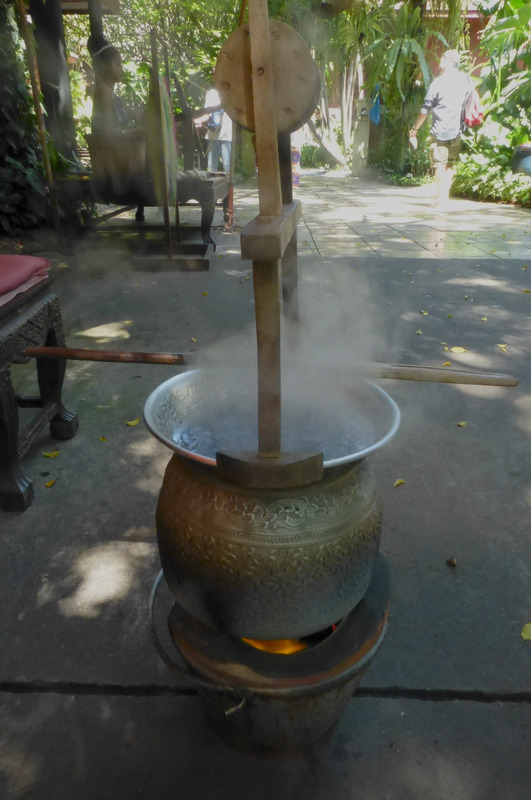 His Bangkok home is now the Thai House and Museum and visiting it richly rewards the visitor. The museum can only be visited as part of a guided visit. The experience is well-managed so you get just enough time to have a look around before your are shepherded on to make way for the next group. It’s a popular tourist destination that does get busy, helped, I imagine by its central location within an easy walk of the National Stadium BTS Sky Train station and the ever popular MBK shopping centre. 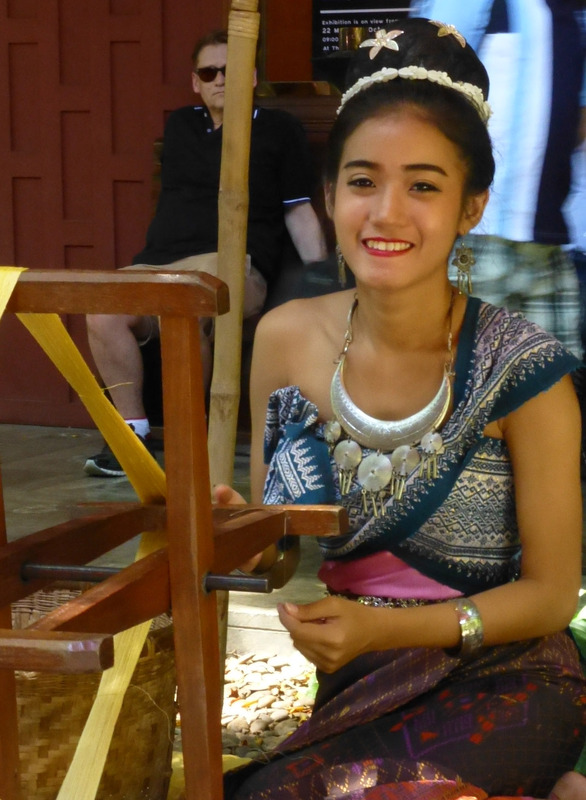 There is a loom on site, but it has not been restored to working condition so the insights for the weaver are few, though they did have a beautiful young woman to spin silk and pose for photographs. The other side of the Jim Thompson story are the Jim Thompson retail outlets which sell silk fabrics, scarves, clothing, bags and homewares. These retail outlets are dotted around places that tourist frequent, including on the museum grounds and Bangkok airport. Prices are high and for the bargain (or at least discount) hunter, there are six factory sales outlets in tourist friendly locations around Thailand, including Bangkok. We visited the Jim Thompson Factory Shop in Bangkok and found it to be a good retail experience. 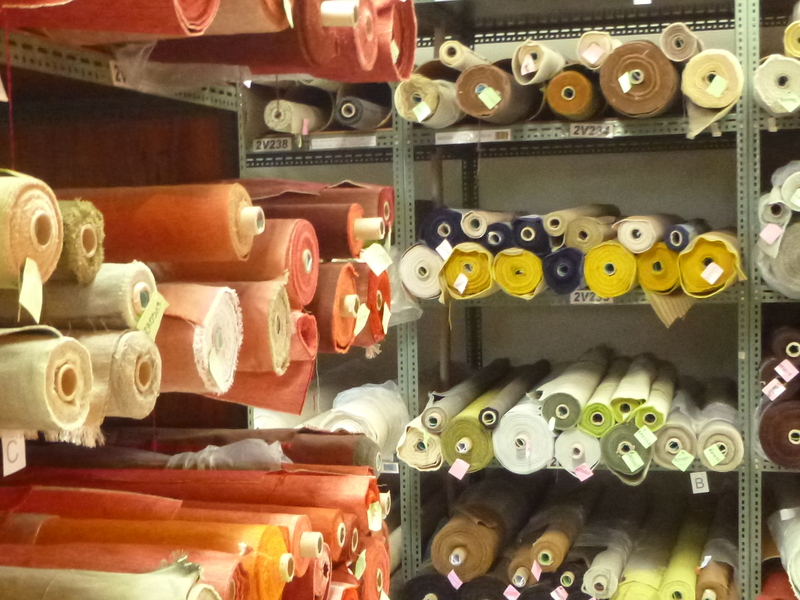 The outlet shop has a good range of upholstery fabrics in silk, linen and more, plus furnishing items. The address is 153 Sukhumvit Soi 93. 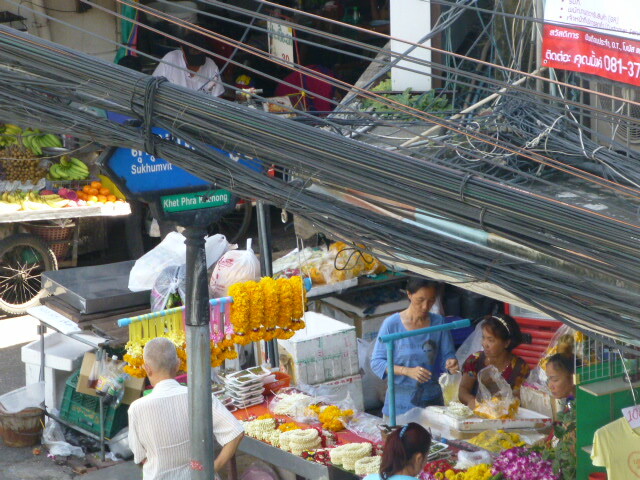 To get there on public transport take the BTS Sky Train to Bang Chak station, use Exit 5, then walk up Soi 93. You can’t miss the Jim Thompson Factory Shop as it’s a stand alone four or five storey building on the left hand side of the road and it has the name out the front. The Jim Thompson Factory Shop is open daily 9am- 6pm. If you are looking for high quality, well packaged gift or souvenir items, this is a good place to go. This entry was posted in Journal and tagged fabric stores, museums, silk, travel. Bookmark the permalink. A lovely place to visit, I did manage to bring some fabric back, hope you did too! My fabric purchases were from Sampeng Lane but my beloved found a linen shirt at Jim Thompson that will be perfect for our future holidays in tropical locations. We’re already talking about the next holiday. They weave in South America don’t they? And then there’s Indonesia, the home of batik…. This sounds like a fascinating place for a fiber vacation. It’s too bad they haven’t restored the loom to show the process. I completely agree. Traditional skills are being lost in Thailand, just like everywhere else. That’s why HM Queen Sirikit’s support for traditional textiles makes such a big difference.